German rabbi; born at Gailingen, Baden, in 1805; died at Buchau March 3, 1841. He pursued his Talmudical studies at Endingen, Manheim, and Carlsruhe, and then entered the University of Heidelberg. After passing his examination for the rabbinate, he first became assistant rabbi at Oberdorf, Württemberg (1829), and then rabbi at Buchan (1834). 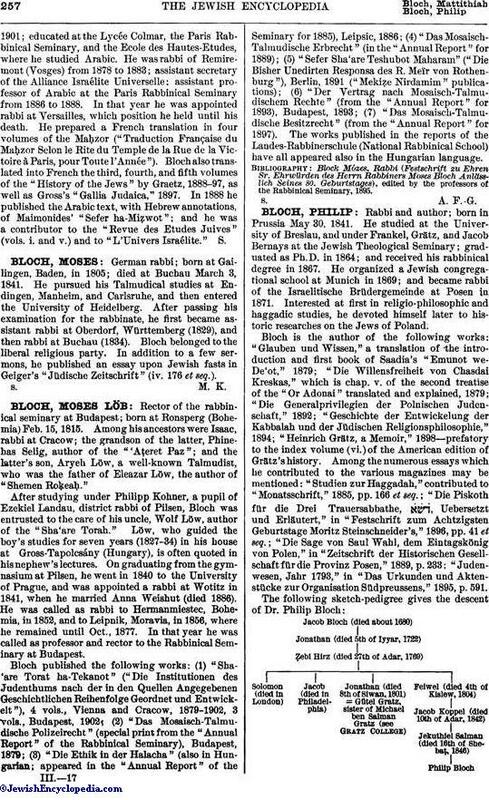 Bloch belonged to the liberal religious, party. In addition to a few sermons, he published an essay upon Jewish fasts in Geiger's "Jüdische Zeitschrift" (iv. 176 et seq. ).